The strength of our intervention model comes from basing every intervention firmly on the experience of women who have been battered, coordinating a consistent criminal justice system response for men who batter, and offering these men opportunities for change. The effectiveness of this approach is witnessed by the men who have chosen to change and the women who report they are safer. 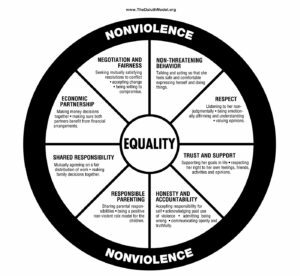 The Duluth Model men’s nonviolence program helps facilitate men’s change through a process of critical dialogue. Our facilitators create an open learning environment that respects the men, their experience, and their thinking, but also challenges their entitlement to abuse. Participants are challenged to question the beliefs they each carry about themselves, their partners, and the world. Together, participants and facilitators analyze how men use violence, what beliefs give them permission to control their partners and their children, and the impact of this violence on everyone. The program then explores and practices non-controlling and nonviolent alternatives. Assist the participant to understand equality, respect, love, and partnership by examining the actions, intents, and beliefs necessary to realize these positive characteristics of relationships. The program is offered to court-ordered/DCF approved individuals, although a court order is not required for participation. Anger Management Group meets Tuesdays 4- 5 p.m.
Batterer’s Intervention Program meets Tuesdays from 5:30 – 7 p.m. Call (941) 639-8300 x 2226 for more information.